Obviously the Christmas present plan didn’t happen. 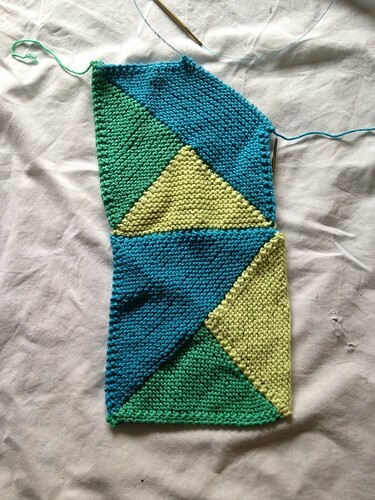 I’m not sure why I thought I could knit a DK weight baby blanket in 20 days, but I did. I might have been able to if I hadn’t also knit a Christmas stocking for my little cousin and several other things. Oh well. I did finish it, but not until April 12. And my niece loves it! 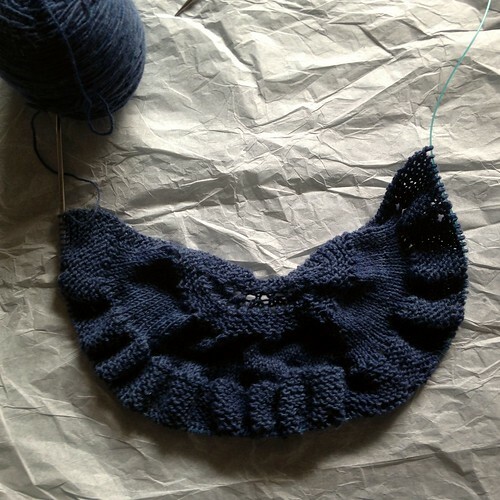 On September 22, 2014 I started my Alight Custom Fit sweater as part of a knitalong at The Fiber Gallery. You should know by now that KALs are pretty much the kiss of death for any project I start. I’m pretty terrible at them. 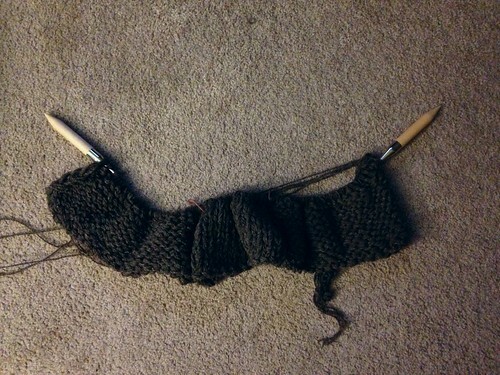 To make it even worse, the yarn I used (Madelinetosh Tosk DK in Ink) was originally intended for the Katarina KAL, which I started on 10/10/10 (cool!) and later frogged. Pretty sure this yarn is doubly cursed. 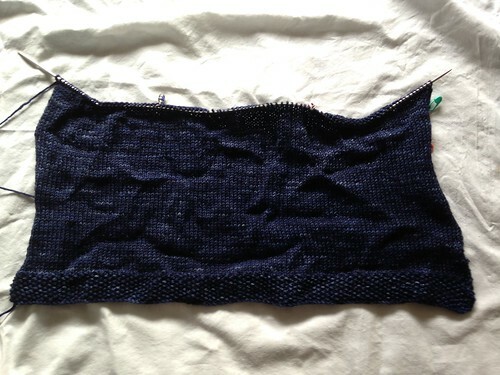 However, I have been making good progress on this project, even though it’s *gasp* a sweater! I have finished the back (pictured here), finished both sleeves, and am currently working on the right front! I am pretty sure this sweater will be done in time for fall. This WIP is a bit challenging to work on because it’s large and requires four cones of yarn. Because of that, I never take it anywhere. It lives next to my couch and I work on it while watching Netflix. Since I have been neglecting my couch and Netflix, I have also been neglecting this blanket. Recently I’ve been working on it a bit more, and at this point it’s nearly halfway done. Not bad for a few rows here and there! Sadly the hot weather we’ve been having is also not very conducive to blanket knitting, but I’m sure it will cool down at some point. Verdict: I’ll finish it, and probably pretty soon. The Space Monkey socks were started on June 1, 2014. They are included here because they were technically a WIP at the beginning of the year, but I finished them on January 1, 2015. On January 17, 2014 I cast on for Follow Your Arrow. I should have known this was a bad idea, as I’m terrible at KALs. But this one would be different, right? It was Ysolda, it wasn’t *just* a mystery, it was also a “choose your own adventure” type mystery! Well, I stuck to it for part of the first clue (1B) and then abandoned it, true to my usual form. Verdict: Undecided. There are a lot of nice finish projects, so I might go back to it with less mystery. The Pinwheel Blanket was started on September 17, 2013. This is one of those embarrassing ones, because it was started as a gift for my friend’s baby who wasn’t born yet. I think he’s about to have his 2nd birthday, and all I’ve got is almost two squares. The blanket was, in theory, a good idea. Cute, easy (it’s garter stitch for goodness sakes! )… It is probably too late for this particular baby, since he is no longer a baby. Verdict: Finish it, someone else is sure to have a baby someday! It’s still one sock and a ball of yarn. Verdict: Knit the second one, I need to take pictures for a Ravelry release! On June 13, 2013, I cast on for Yvaine in a skein of old Sweet Georgia sock yarn. The yarn isn’t superwash, so I knew I wasn’t going to use it for socks. The shawl pattern is named after one of the main characters in Stardust, which is one of my favorite books, so I really couldn’t resist knitting this shawl. I honestly think I stopped working on the shawl because I lost it / set it aside and forgot. It’s actually a really great mindless project for TV knitting or knitting group, and I’m looking forward to finishing it. In fact, I’ve already put some more work into it since the beginning of the year! 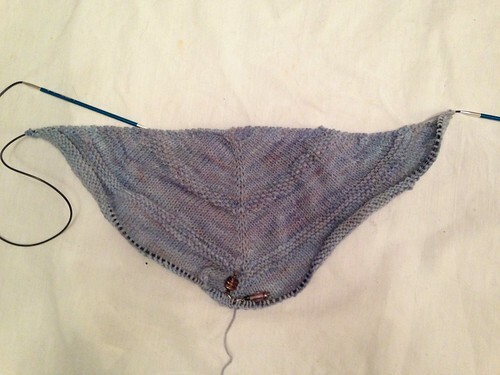 Remember last week when I talked about casting on Lenore for a KAL but figuring out it was the wrong pattern? Well, on February 1, 2013 I cast on the correct pattern, Raven Swirl Socks. This WIP got even less progress than the last! I’m barely past the cast on, which makes it tempting to rip these out for the sake of my WIP numbers alone, but I do intend to make these socks someday. For now they get a reprieve. Verdict: Finish them, I think.